To kick off the hot summer season, we’re giving away a 7lb Barley Crusher malt mill to an email subscriber picked at random from our subscriber list. 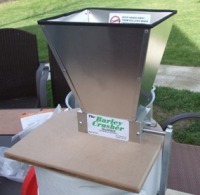 The Barley Crusher happens to be my personal choice of malt mill – I’ve had mine for several years now, and love it. On June 15th, I’ll select one email subscriber at random from the list of all subscribers at that date to receive the Barley Crusher. This includes both those who subscribed previously through feedburner, and our new newsletter subscribers, though I will eliminate duplicate emails. We’ll also give away 10 copies of BeerSmith! In addition, I’ll select 10 others from the email list at random to each receive a free registration key for our BeerSmith Home Brewing software. How Can You Enter this Drawing? Simply subscribe to our newsletter and stay on the list until June 15th – you’ll get a newsletter about once a week with home brewing articles, tips and links as well as notifications when we post a new article here on the blog. You’ll also get a chance to win one of the prizes. Unfortunately we can only offer this drawing to email subscribers, as we need your email to contact you if you win! Subscribe To BeerSmith Home Brewing to Enter! Drawing Rules: The drawing will be made at random from the list of verified email subscribers on 15 June 2010. Winners will be contacted via their subscribed email address. If a selected winner fails to respond to our email notice within 7 days they will forfeit the prize in its entirety, and another winner will be selected at random. More Legal Stuff: Prize winners are solely responsible for all applicable taxes and fees associated with receiving their prize. By accepting a prize, each winner releases BeerSmith and their respected officers, partners and employees from any responsibility or liability in connection with any prize awarded. By entering this giveaway, entrants accept and agree to these rules. By submitting an entry, a winner agrees to allow use of his/her first name for advertising this or similar promotions and allow us to post your first name on our site as the winner of our giveaway without further compensation. Winner agrees to release BeerSmith and its partners of any injuries, losses or damages of any kind resulting from acceptance, use, misuse, possession, or loss of the prize. No Purchase Necessary. Void where prohibited or restricted by law local and national regarding contest. Thanks! I’m going to sign up – I’m trying to brew my own beer now and this would be a welcome aid!